Jongste wil dat ik deze voor zijn verjaardag bak. Mijn galstenen jubelen, ik voel me net een sambabal! A delicious layer cake that will delight any Twix lover. 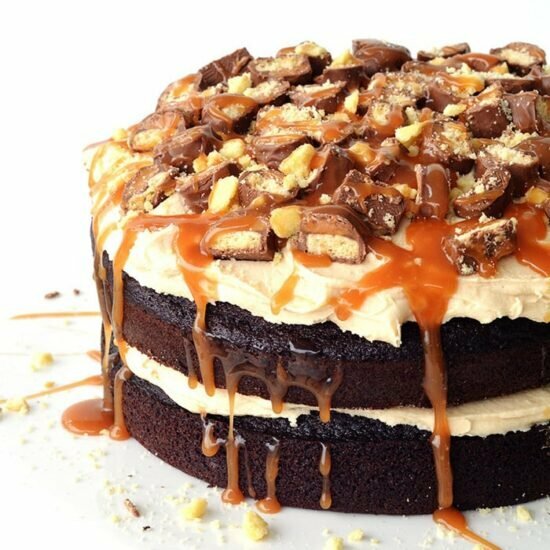 Soft and fluffy chocolate cakes with a creamy caramel frosting, topped with chopped Twix bars, crushed shortbread cookies and homemade salted caramel sauce! Preheat your oven to 360 F (180 C). Grease and line two 8 inch round cake tins. In a large mixing bowl, sift the flour, cocoa powder, baking powder and baking soda. Then add the sugars. Whisk together. In a separate mixing bowl, add the buttermilk, vegetable oil, vanilla and eggs. Whisk together. Add the wet ingredients to the dry ingredients. Start to fold together, slowly pour in the hot water, and continue to mix until all the ingredients are incorporated. Divide the mixture into the two cake tins and bake for approximately 30 minutes or until a skewer inserted comes out clean. Leave for 10 minutes before gently removing the cakes from their tins and leave them to cool completely on a wire rack. To make the frosting, add the butter to a large mixing bowl and beat until smooth and creamy. Add the powdered or icing sugar and beat until smooth. Add the caramel sauce and continue to beat until creamy. To frost the cakes, you may need to trim off the dome of the cakes using a large serrated knife or a cake cutter. Then, add half the frosting to the top of one chocolate cake and then add the other chocolate cake on top. Frost with the remainder of the caramel frosting. Finally, top with chopped Twix bars, crushed shortbread cookies and drizzle with any extra caramel sauce. Gepost door Polderdame op 3:49 p.m.